The name ‘Mora’, has become as a well known name over the entire world not just in Sri Lanka. That’s because of our super heroes. 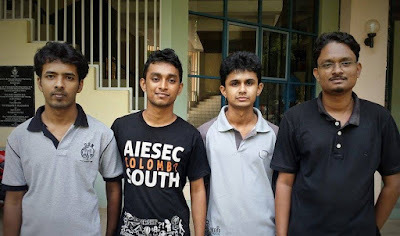 These Mora guys, have uphold, the name of University of Moratuwa to the very top level. And here's one more story about ‘Mora’. 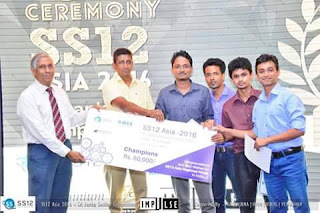 Today we come to you through the moramag with the details of smart 4 guys, those who had participated to Ss 12 Asia 2016competition on behalf of our campus and obtained the first place. Q1: How did you participate to this competition? Actually Charith came up with details. He told us there is a competition and let’s go and participate. And our exams are too close by then. At the beginning I was not interested. But after hearing about the idea I felt like this need to be done. Q2: Who did organize this competition? Who had the opportunity to participate? If you describe about the competition? Competition has organized by the IEEE. Competition was held among inter-universities. 40 teams were participated for competing. 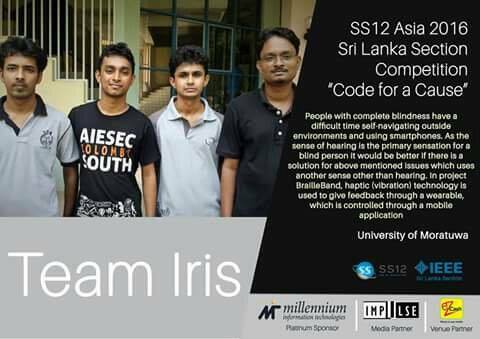 We participated to the competition which is conducted under Sri Lankan section in Ss 12 Asia 2016 competition. The world’s best teams participate the competition that is held in India in this September. Q3: Do you think that you can give a good fight with your product at the Asian Competition? Actually the fact is no one has presented their products yet. And we too. Even when we participated the competition in Sri Lanka we didn’t know about other products. I believe that there is no product like ours. The one and only product is to connect blind people and IOT is ours. And there are some ways to evaluate our proposed solutions. They focus on novelty and how the product is reliable. Actually about whether it can be used or not. Q4: What kind of products had been presented under Sri Lankan section? 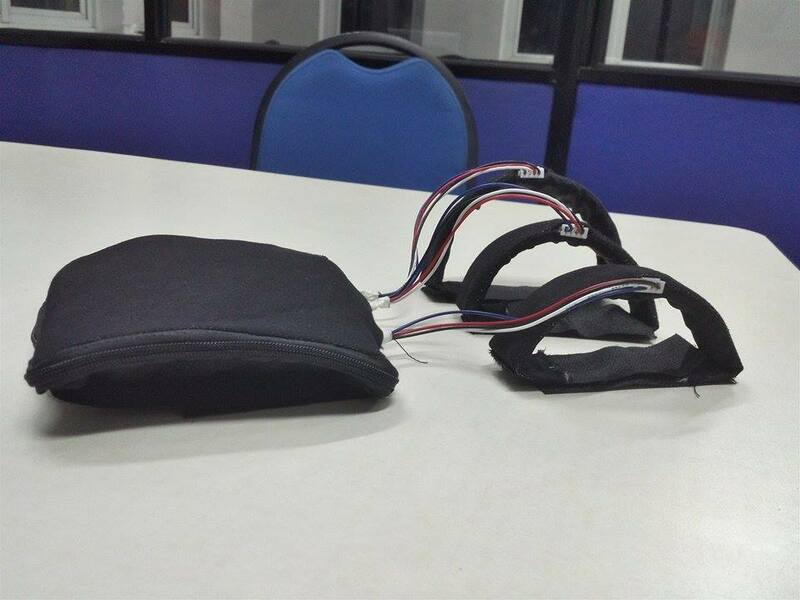 There was a kind of product that can teach blind kids. How can one identify his gender is. And a product on how to wake up a blind asleep kid and so on. Q5: If you give a brief about yourself.., school, campus sand extra-curricular activities? I am Achintha, School was Rahula College and member of AIESEC. I have worked as the field rep in the department. I am Charith and went to St. Thomas' College, Matara. I am Harin and went to school Rahula College, Matara. I have participated the Hakathon competitions. Q6: So what about the support from campus? Anjula De Silva sir helped a lot. After just telling our idea, sir said that this is a better idea and even if not focus the competition, our path is already clears. He pushed us and still helps us. Q7: So how long did you work with this product? We had only 2 months. And that was the exam period, going on for 3 weeks. We started on the last week of June. Because of having no choice we finished a lot before the exam. Q8: How did you do this work? There are 2 parts, Hardware and application. Hardware part is done by Wishwa and me. Application, documentation and presentation is done by Harin and Achintha. Q9: Do you think that your product was succeeded? We mentioned our scope when we submit the proposal. We covered it. 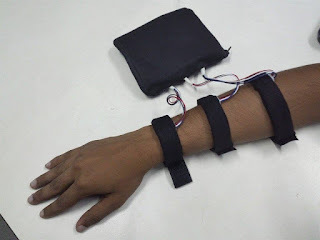 Other than that when we send a text via mobile phone, there is ability to read it with the help of wearable device that is on blind person. Q10: So, how did you come up with this idea? Actually the theme was given by the competition. It was IOT for divisibility. Then we thought about what are the barriers on blind people. They do their most of the work and get solutions with the help of hearing. We thought in a completely different way. It is a troublesome to them, the text to voice systems. There is no issue for their hearing from our device. They are used to use Braille pattern since their childhood. So that’s why we use that method. Q11: So.. Are you ready for the next competition? We hope to do some future development. Today messenger, viber, whatsapp have become a trend. We wish to develop it; those updates notifications that are to be readable. And if they are connecting with sport channel, then there updates can be taken. And they can find where they want to go to by using navigation on Google. We will develop it up to that level. Q12: Have you ever participated competitions like this before? Actually this is my first time. Others have participated to smaller ones. But this is the first time for a big chance. Q13: What about this great achievement? How do you feel it? We had no idea to win when we participated. We had idea to get experience. We wanted; our idea is to be reality and share in the world. First we send text from one to another. But then we met a blind person and tested it. Actually he was really happy about it. They used to it within less time. Q14: What are the future plans? We wish to develop this further. And this is a big chance to go ahead with or product. Q 15: What do you have to tell new comers to the campus? So… Innovation is a trend. Now it is in industry too. New ideas are taken from competitions like Hackathon. When we have opportunities we have to give our ideas to the world. We really have to have a passion. Then we can successfully make it as usable for individuals. Q16: What kind of challenges did you faced? The Biggest challenge was the exam. On technical hand, the usage of vibration motors. There are 6 points. We should give those separately to the person. Letters are identified through this. It was a big challenge. We do design twice made 3 bands. Through this, 6 points can be identified separately. Q 17: Do you think that this was succeeded and will be useful to blind people? Of course, actually is on prototype level. Even it is on that level we tested it successfully. He could use to this within lesser time. So it says that if we develop further it will be very useful. Q 18: Is there any product that can compete with this? What kind of development is expected to do in the future? There is no product like this as per our knowledge. And the idea should be a new one when applying. We have to small the size of product like a watch. We do it for the next competition. Q 19: Oh, remember those who cooperate.? Anjula De Silva sir helped us a lot. We earned a big help with IEEE who organized this. Also, our parents, our friends have to remind. Q 20: And what about our media club, moramag? You do a really big job, sometimes even we win competitions most of are do not aware. And if some of us went right to get help, they may not like to help because of knowing it at first. So you give a chance for all to aware. So you provide a chance to know about competitions. Actually thank you very much to moramag crew. Q 21: Finally what can say to motivate others? Like we said before, our product is need to be reality there should be a passion. We can do something to the world, of course. Yes . That smart guys said it Actually Mora guys are the best example for innovations. If they have better help from responsible parties, it is not too far away, the day which is going to happen a miracle in the world. So there is a better chance from moramag. This interview is by Natasha Nayanatharanga and Sanduni Gunawardana.